With a photograph of the Hubble Space Telescope behind him, NASA Administrator Michael Griffin takes part in a news conference at NASA's Goddard Space Flight Center in Greenbelt, Md., Tuesday, Oct. 31, 2006. GREENBELT,Md. -- The shuttlemission to refurbish the Hubble Space Telescopeone last time in May 2008 will cost about $900 million from "cradle to grave"and will have a slight impact on the development of the launcher NASA will useto replace the shuttle fleet, NASA AdministratorMike Griffin said today. Speaking atGoddard Spaceflight Center in Greenbelt, Md., where the legendary space telescopewas designed and built, Griffin emphasized that the decision to go ahead withthe controversial Hubble servicing mission was made only after a lengthyanalysis of the risks. That analysis led agency officials to conclude thatHubble's life can be extended to about 2013 without posing undo danger to thelives of the shuttleastronauts who will conduct the repairs and upgrades. The costincludes about $500 million for keeping the Hubble team together from 2004 --when Congress and many in the science community convinced former NASA AdministratorSean O'Keefe to reconsider his decision to cancel the Hubble servicing mission--through completion of the mission in 2008. O'Keefeinitially canceledthe mission in response to the February2003 re-entry accident that destroyed the shuttle Columbia and killed itscrew. Some of the $500 million already has been spent to pay for studies intothe feasibility of a robotic servicingmission that would not require astronauts. Griffin said that option was rejectedby NASA and advisory panels who all concluded that it was not feasible giventhe limited amount of time and money available. Thegyroscopes, batteries and instruments slated for Hubble will cost another $200million, NASA said. In addition, the agency will need to spend $100 million forthe extra shuttle external tanks and solid-rocket boosters that will have to beordered to squeeze another mission into the shuttle manifest. Another $100million will go to pay for processing another shuttle for launch. Theastronaut crew will consist of Scott Altman, Gregory Johnson, Andrew Feustel,Michael Good, John Grunsfeld, Michael Massimino and Megan McArthur. Chuck Shawwill be the mission director. NASA'srelationship with Hubble has been long and storied. Initially considered acostly failure when it launchedin late April 1990 with a flawed primary mirror, it has since been lauded asNASA's most successful scientific endeavor. The firstservicing mission repaired those damaged optics by installing what Mikulskicalled "the most expensive contact lens ever built." Four additional servicingmissions were conducted over the years to add new instruments and replace partslike batteries and the gyroscopes used to orient the telescope. But withthe Columbia accident, in 2002, Sean O'Keefe announced there would be nofurther missions to repair Hubble, citing astronaut crew safety as a chiefconcern. 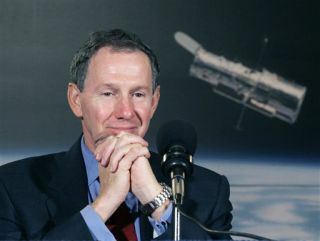 Theannouncement follows a commitment Griffin made at his confirmation hearing, in2005, when he pledged to base his decision on whether to send an astronaut crewto repair Hubble on the completion of two successful shuttle missions and aprofessional review that the mission would be safe. Three post-Columbia shuttlemissions later (one was not considered a total success), Griffin fulfilled thatpromise. Whileshuttle missions to the International Space Station offer crews a safe haven iftheir shuttle is damaged, the Hubble repair mission offers no such security. Griffinnoted that the detailed studies conducted by NASA, including work done duringrecent shuttle missions, helped the agency conclude that an astronaut would beable to conduct some repairs of a shuttle that sustained heat-shield damage asColumbia did. During the STS-121 mission, Griffin said astronauts tested somerudimentary procedures to make small repairs to a heat shield damaged byexternal-tank foam debris or orbital debris. And thenthere is the option of sending that second shuttle on a rescue mission. While therewas great excitement about the mission, which is intended to extend Hubble'soperational life until about 2013, there also were acknowledgements that thereis much work to be done. "You nevercelebrate until you succeed; we all celebrated on the launch of Hubble in 1990... the champagne does not get opened until the servicing mission is over. I'velearned that lesson too many times," said Ed Weiler, director of Goddard and aformer Hubble program scientist at the time of the initial launch. Hubble Puzzle: How Safe is a Shuttle Servicing Mission?